For a couple of years I spent a great deal of time on something I called Match Impact. This was basically a method of assessing player performance by taking the win probability of a Test team at any given point in a match, then assessing the impact of the various events like a batting partnership or wicket by comparing the win probability before and after the event. Then I apportioned the credit for these events between the various players involved, i.e. batsmen, bowlers and fielders, before totalling the various credits for individual players. The idea was to come up with a single player career rating which took into account everything the player does, batting, bowling and fielding; in this way we could compare batsmen, bowlers, wicket-keepers etc. on a level playing field, as it were. Regardless of the relative success or otherwise of that exercise, the fact remains that when we compare players we tend to do it using their main discipline – Kallis is typically compared to Tendulkar only on his batting, Botham is compared to Lillee only on his bowling, and so forth. So, despite this being the antithesis of what I was trying to achieve with match impact I decided out of general interest to do the same, i.e. compare batsmen solely on their batting, but from a match impact point of view rather than traditional batting average. The match impact rating that I proposed previously is expressed as a percentage per Test, e.g. Garry Sobers’ match impact per Test might be worth say 21%, whereas Dennis Lillee might be worth 19%, but those figures don’t really mean much to anyone else but me as there’s no real frame of reference. So what I decided to do was to a) separate out the impact solely based on each player’s batting, then b) extrapolate that to a value which is equivalent to the range of Test batting averages, with the intent being to provide a rating scale with which those who follow cricket would be familiar. I assumed that the obvious basis to scale from is Don Bradman. As was seen with my full impact exercise Bradman is the highest rated pure batsman (no adjustment for opponent) and as a result will have the highest impact from batting only, so we can use his batting impact rating and Test batting average to scale from. In order to scale the others I had to run Bradman’s batting impact separation first and this gave me a figure of 22.06% – that is the equivalent impact average figure which is equated to Bradman’s batting average of 99.94. In this way, once I ran each player’s batting impact I could then scale it to an equivalent batting average scale by comparing it to Bradman and baseing it on a 99.94 batting average. Even though I’ve built up a large database of Test cricket events this stuff still takes a long time, so I’ve decided to split the work in two, the first half cutting off at Greg Chappell (based on CricketArchive player number, rather than by debut or retirement date), so just before Sunil Gavaskar. Once I’ve completed the second half I can do a full comparison, then repeat the exercise for bowling and fielding. Using a batting impact of 22.06% as equivalent to a batting average of 99.94 (which is near as dammit 100), this gives us an equivalent batting average of 50 as equating to a match impact of around 11%, which if we weren’t converting to an equivalent average would be our magic number. I don’t even know for sure if the relationship is completely linear, though I don’t see why it wouldn’t be and certainly looking at the various equivalent averages it does appear to be pretty close to being linear. What match impact also does is to remove any era variations, as the win probability already takes that into account. I’ll first present the equivalent batting averages chronologically, split into three groups which roughly equate to pre-WW1, between the wars and post-WWII to about 1980 (or Chappell). Remember these aren’t actually batting averages – they’re not era-adjusted batting averages, they’re not opposition-adjusted averages, they’re not any kind of batting average; they’re a match impact average percentage which has been scaled to resemble a batting average for ease of comparison. What we can see here is that, despite playing in almost the same number of Tests and having virtually the same Test batting average, Trumper had significantly more impact through his batting in Tests than did his compatriot Clem Hill. In fact, Trumper’s impact average is slightly higher than Jackson, whose batting average was almost ten runs higher than Trumper’s but who played in only about half the number of Tests. Grace’s heyday really pre-dated Test cricket but he still had as much impact as did his own nominee for top batsman, Arthur Shrewsbury. As with Hill and Trumper, we can see that Hobbs, despite a lower average than his partner Sutcliffe, has a significantly higher equivalent impact average, in fact the highest to date. 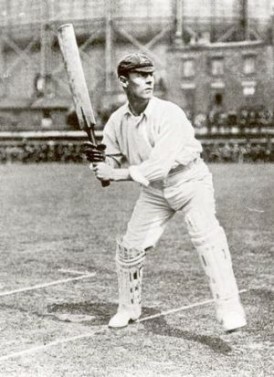 South Africa’s Herby Taylor, who was good enough to average 50 in Tests with the great Sydney Barnes in the opposing attack, also fares pretty well by this measure and is much closer to Sutcliffe on impact than traditional batting average, the difference being halved when looking at equivalent impact – Taylor was described by ‘Jim’ Swanton as follows: “His method was so sound that he remained a beautiful player when nearer fifty than forty.” Clearly he had some impact, too. Into the next group of 400 now, and I doubt that anyone needs an introduction to the three batsmen listed above. Bradman naturally shows as having the same for equivalent impact as his batting average, as his numbers are being used as the basis for our scaling, with other players showing higher or lower than their actual batting average based on their impact as compared to Bradman’s. Hammond shows as being further behind Headley based on impact than on purely batting average, with Headley achieving the highest level of impact batting so far (after Bradman, of course). Hammond though makes up a lot in total match impact due to his bowling, as well as in fielding. Martin Chandler pointed out in his feature on Hammond A Complex Man that had he not returned to Test cricket after the war Hammond would have retired with a Test average of 61.45 and would thus have been ranked second only to Bradman. Similarly, ignoring also the impact from those post-war Tests, Hammond’s equivalent impact average would be about 7% higher. Hutton shows a very high impact average, and we can see that the ‘minnows’ were well-represented by the other Sutcliffe, New Zealander Bert. Arthur Morris was Barry Richards’ opening partner in Don Bradman’s dream XI and we can see why. On to the third group of the first part of the study, players 801-1200. I’m not surprised to see Neil Harvey rewarded here, he had a number of high impact innings which may not be fairly reflected by his traditional batting average. Everton Weekes rates as having the highest impact average of the three Ws; I don’t have a problem with that either, as I’ve always considered Weekes to be the finest batsman of the three – as Jim Laker wrote He has the killer instinct…he murders the bowling. Glad to see the batting of Hanif and Peter May recognised (Hanif significantly so) and though Sobers’ equivalent impact average is lower than his batting average, the best all-round player ever still ranks highly on batting impact alone. I had thought Dexter would take more of an upward hike based on his batting, but he does rank much higher when his bowling and fielding impact are also taken into account. Cowdrey inches closer to Barrington on this measure, though still some way behind. Kanhai and Hunte in particular rate as high-impact batsmen in this impressive group of West Indian batsmen. Pollock has the highest impact rating since George Headley – note that his compatriot Barry Richards rates at an astronomical 78.96, albeit over just four Tests and, though he has been highly rated by many expert witnesses, it’s unlikely he would have been able to maintain that level over a significant number of Tests. Sir Geoffrey, deaspite his somewhat dogmatic approach, rates well from an impact perspective. I saw Ian Redpath bat at Headingley during the 1968 Ashes in what was my first taste of Test cricket, thankfully he treated the crowd to a fine 92, which was just as well as Cowper had crawled to just 15 by lunch. The final two batsmen featured this time around, Chappell still rates higher than Turner, but the gap is much smaller as regards impact than when considering batting average, where the difference is close to ten runs. Even though we’re only halfway through, it’s amazing to see that Bradman still has such a large lead over the rest based on actual batting impact. If we were to rank the same group of 1200+ players by batting average, then we can see from the above that Hobbs has moved up the rankings significantly, as have Hutton and, particularly, Harvey. Roy Dias was ‘a joy to watch at the crease’, though he did not begin his Test career until age 30 upon Sri Lanka’s election to Test status. It would be nice to think that I’ve unearthed a method of ranking stylish batsmen more highly, however it’s more likely that those who thrilled us also had significant impact as compared to how their batting average rates them, when compared to their peers. Victor Trumper was nominated in Number One by Simon Wilde as being the champion batsman for ten years at the beginning of the 20th century. From the above rankings it is clear that Trumper has benefitted from this study more than any of the cricketers assessed so far. There are times when an early and tragic demise will result in a kind of ‘halo effect’ regarding the person who was plucked from us too soon, and though Trumper was no Archie Jackson, he had played some of his best cricket just three or four years before his death – the fact that he died from Bright’s Disease, from which I myself suffered as a child, has had no impact on my opinion of him. It seems in Trumper’s case that all of the accolades afforded his batting were warranted – I am delighted to propose a rating system which sets him closer to his true place among the great pantheon of batting greats. Next time we’ll look at the second group of batsmen, from Gavaskar-onwards.